HISTORY: This is the first limited edition figurine by Goebel Miniatures and production was limited to 5000. There are a total of three figurines in this Alice in Wonderland Series. The story was taken from the classic books by Lewis Carroll, Alice's Adventures in Wonderland and Through the Looking-Glass, which were published in 1923. 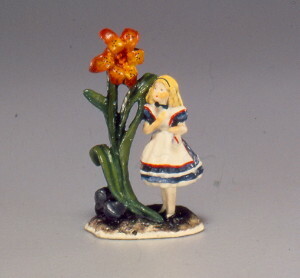 In 1982, Miniature Collector magazine commissioned Goebel Miniatures to produce an Alice in Wonderland figurine. The logo of the magazine is Alice, and they wanted something special to offer for sale to their readers to commemorate their fifth anniversary. The studio through that since this figurine would signify an anniversary, they would produce this figurine for only one year. Thus their first limited edition was born. Little did the studio realize what was to come. Alice was the studio's first magazine centerfold girl! GENERAL: Curious little Alice was following a path through a large flower bed on her way to the top of a high hill where she could view all the flowers at one time. She was lost and could not find the proper path to the top. She came upon a tall tiger lily waving gracefully about in the wind and exclaimed, "We can talk, when there is anybody worth talking to." The figurine depicts that point in the story. The astonished Alice is caught off guard and puts her hand to her chest in surprise. This was a fun figurine for Bob to carve. He purchased the book and drew his figures from words in that book. He could not define her intelligent and curious character by her face alone, so he had to rely heavily on body gestures. Alice was very tiny, so Bob placed her against the tiger lily to indicate her relative size. Few observers notice the face inside the flower, "After all, if it can talk, it must have a face," observed Bob. There was concern about whether the molten bronze would flow up through Alice's tiny legs, so she was attached to the flower by her right shoulder. This position assisted the metal flow and helped keep her upright. Painting the bow on the back of her dress was most tedious. Bob carved a raised surface, but cutting the white of the bow into the blue of her dress was extremely difficult. For the next figurine, "Down the Rabbit Hole," he backed her up against the tree to eliminate the problem. The base has a green underglaze with a brown wash over the top to accent the details of the base. Bob was experimenting with a new technology whereby the sculpture itself assists in painting the figurine, and he designed the shape of the rocks to help the painters. The orange and yellow of the flower are particularly well blended and complement each other. The blue of the dress was chosen to match the logo for Miniature Collector magazine. Alice has very scraggly hair and some early pieces show slight variations in her hair and coloring. After the first few were produced, Bob decided she should have a headband, but those few from early production were shipped without one. Are you fortunate enough to own an Alice without a headband? In January 1982, all the bases for the entire line were changed from a painted white to a natural buffed bronze. This change was made in mid-production, so both will be found on "Alice." SIGNED: Under her skirt in back. VARIATIONS: Slight variations in hair and coloring; between 25 and 50 were produced without a headband on Alice; the bottoms of the bases can be either painted white or buffed bronze, but the number with white bases is probably quite small. A "Process Stick" was made to depict the production process. Below is an image of the steps involved in creating Alice in the Garden.